Description: 1. 100% Brand New & Waterproof High Quality 2. Material: PVC 3. Color: Multi color 4. Package:1pcs/bag Car Sticker. 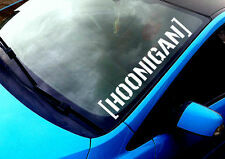 Hoonigan Windscreen Sticker. Any Colour From Our Colour Chart. our colour chart in our photos. Manufactured from high quality, durable, self adhesive waterproof 5 year vinyl. Simply follow the fitting instructions included and apply to any flat non porous surface (anything that don't absorb water). Remanufactured from long lasting Sign vinyl in Two colours. Sent with transfer paper applied will include instructions. Very easy to apply. Other colour's upon request. 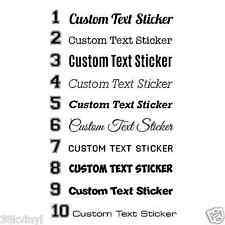 You will receive high quality vinyl stickers printed with white ink on the reverse side. These stickers are for fitting from inside the window and will have adhesive on the face side. Stickers can be made for external fitting. SIZE: 80mm x 40mm. Our Decals are manufactured from Self Adhesive 7 Year Superior Quality Vinyl and are resistant to weathering or fading. Our decals are die cut, so there is no background and will blend in perfectly to wherever you choose to apply them! 2x TRD clear stickers. These are full colour, outdoor suitable stickers and are produced on outdoor grade gloss or semi gloss vinyl of either 75 or 100 grade. Outdoor use solvent inks are used throughout for long life and fade resistance. Size: 100mm x 55mm Each. 2 x 69 USA Stickers. The White part is the backing paper and not part of the Sticker. These are for external application.Easy to apply, Peel and Stick. High Quality professional grade printed vinyl sticker / decal. SIZE: 180mm x 45mm. Our Decals are manufactured from Self Adhesive 7 Year Superior Quality Vinyl and are resistant to weathering or fading. Our decals are die cut, so there is no background and will blend in perfectly to wherever you choose to apply them! 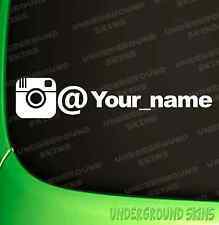 Car Side Air Vent Fender Cover Hole Intake Duct Flow Grille Decoration Sticker. Quantity: 1pair(2pcs). Notice: The vent only for decoration but not real air vent. 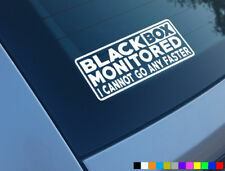 You can stick this on any part of car surface. This is a die-cut vinyl & are one colour with no background. These stickers will stick to any type of smooth surface. Retro Car Sticker. High Quality professional grade printed vinyl sticker / decal. Durable, Weatherproof, Computer Cut from high quality professional grade vinyl. Permanent, yet can be easily removed if you so desire. Famous John Muir quote:-. THE MOUNTAINS ARE CALLING AND I MUST GO. See photos for colour options. Stickers are easily applied to any clean, dry, even surface. Sticker is cut to go on outside of windscreens, car bodywork, fridge door, laptop.any smooth flat surface. CITROEN Total Windscreen Sticker. Sticker is full colour with a white background. I produce many other stickers for classic Citroens and other classic cars. This is not genuine OEM, but a very close accurate recreation of the original sticker design. Car sticker is equipped with four little paw print and one wagging tail on windshield. AKORD 15 Pin Female SVGA/VGA Monitor Gender Changer Adapter - Silver. Designed for cars with a rear window wiper (But you can stick it to any smooth, clean surface). ⦁ Colour: Decals are available in various colours and sizes, per request, choose from the colour map, you can leave a note before checkout. 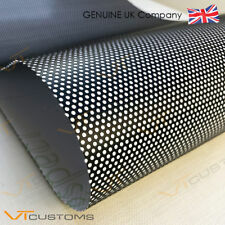 ⦁ Material: Premium quality Ritrama vinyl with 0.07mm thickness. 2x ADAC clear stickers. These are full colour, outdoor suitable stickers and are produced on outdoor grade gloss or semi gloss vinyl of either 75 or 100 grade. Outdoor use solvent inks are used throughout for long life and fade resistance. 2x Koni clear stickers. These are full colour, outdoor suitable stickers and are produced on outdoor grade gloss or semi gloss vinyl of either 75 or 100 grade. Outdoor use solvent inks are used throughout for long life and fade resistance. Sticker Design: Carp Design. Self Adhesive Sticker. Application & Usage: Internal Window, to Face Outwards. Sticker Quantity: 1. Size of Sticker (this is approx. May vary by a few mm's): 90mm x 87mm. JDM Flag Godzilla. These are for external application.Easy to apply, Peel and Stick. High Quality professional grade printed vinyl sticker / decal. Car Sticker. The White part is the backing paper and not part of the Sticker. 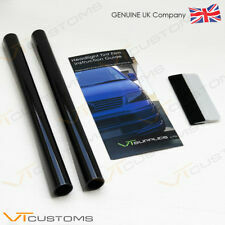 These are normal cut for the outside of your car and really look stunning. The application area of these Stickers / Decals is only a suggestion as these can be placed anywhere that they fit, i.e Wings, Side Panels, Doors, windows, wheels etc. Simply clean (wipe) the surface area. to be adhered to the outside. Size: 110 mm (4.3") x 50 mm (2"). We only use waterproof. Very easy to apply These stickers are intended. but are not reusable. They can be removed. 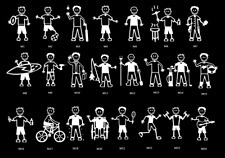 Retro Fido Dido Lying Down sticker, vinyl cut using 5-7 year quality material with no background colour. A great sticker for your car, bike, van, laptop, or anything else you can think of. Sticker size is approx. What you will receive is one vinyl decal sticker, size is 210mm long. The sticker is die cut and the surface you mount the sticker to will be the background colour. The room or area is warm and free from damp. PET Reflective material, printing fine, bright colors. 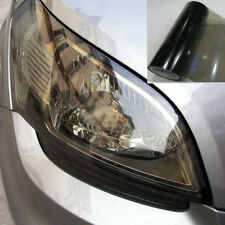 Material: PET Reflective Material. Characteristics: tear off ,leave no trace, can repeatly paste (surface must level off, smooth). Machine-Cutting, don't need to cut,again tear can stick. 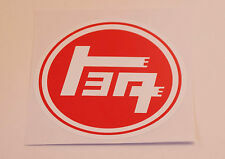 2 Pieces lot Japanese JDM car window sticker/decal "Old Toyota Logo"